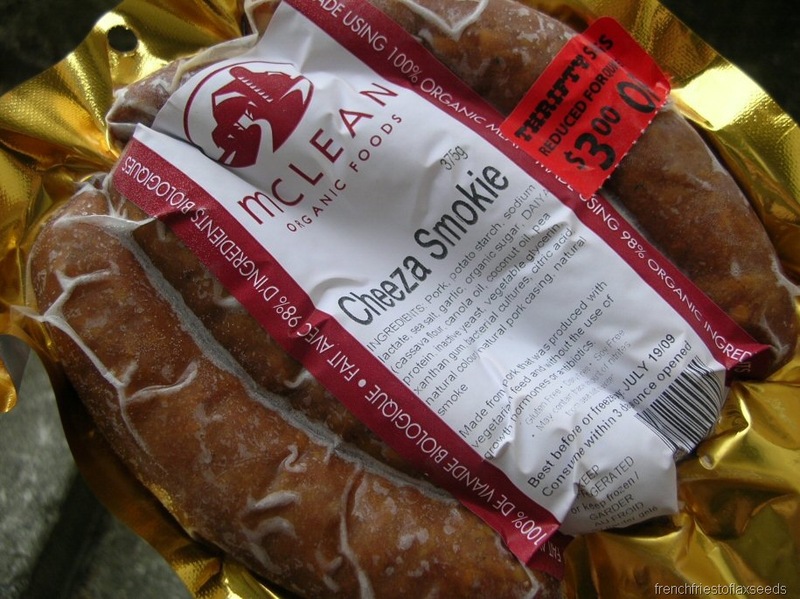 When I was at the store last weekend, I saw that these smokies from McLean Organic Foods were reduced to clear because the expiry date was the day I bought them. I threw them in the freezer when I got home, so I can use them as desired. I had seen the McLean Organic products in the store for a little while now, but had never gotten around to trying any of them. I’ll be honest – the “Cheeza Smokie” probably wouldn’t have been by first choice, but for $3 off, it made the decision easy. McLean Organic Foods are a Canadian company, offering a line of premium fresh & cooked deli meats, all made without chemical food additives. Their products are also gluten, dairy, and soy free – great for those with allergies. This particular product is made with 100% organic pork, and 98% organic ingredients. 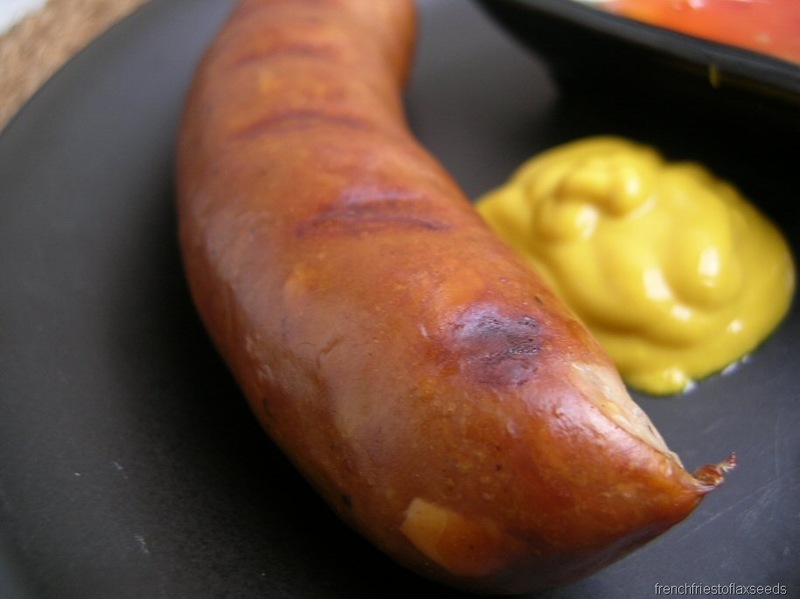 I defrosted and grilled up one of the smokies on the Foreman, and served it with a little mustard for dipping. Can you see that “cheeze” hiding there under the skin? Mmmm, cheeze. And check that out – no filler, not big fatty pieces. My kind of sausage. To go along with my smokie, I roasted up some sweet potato chips. And since I had the oven going, I figured I’d roast my broccoli instead of the usual steaming. 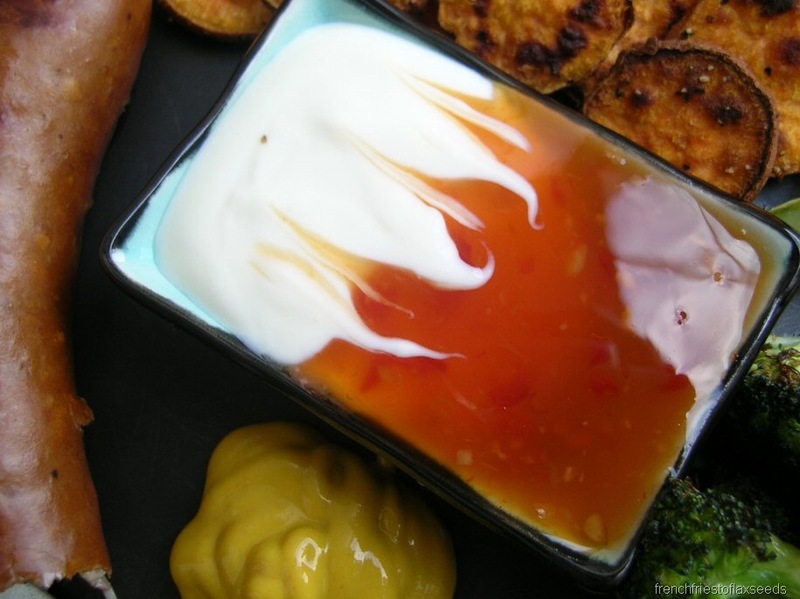 Do you like how I got all arty with my sour cream & sweet chili sauce for dipping? Playing with your food is fun. 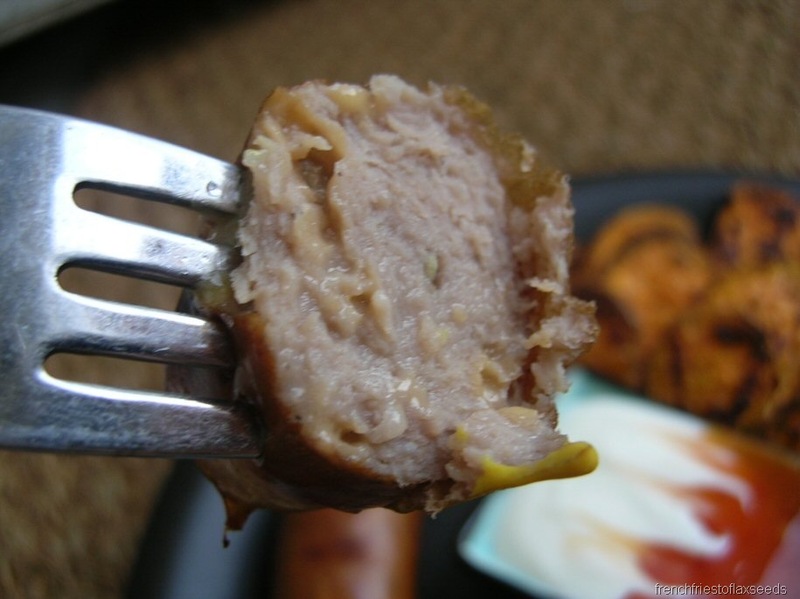 I was a big fan of these smokies. They are very lean (3g fat per smokie), and I didn’t think they were as salty as many of the sausages you’ll find. The flavour was very clean tasting, and the “cheeze” tasted as good as a regular cheese filled sausage. I’d definitely buy them again. I want to try out some of their turkey products as well. So even though my hamstrings, hips, and glutes were still sore from all the work we did last night at boot camp, I had to hit up the gym. I find exercise to be a great reliever of…other crampy pain, if you know what I’m saying. I stuck to the elliptical and upper body strength work, so as not to be too mean to my body. And, per usual, I came home and made my snack/dessert. I’m never sure what to call it – sometimes it’s seems like dessert, sometimes it’s more of a snack. I guess it doesn’t really matter. 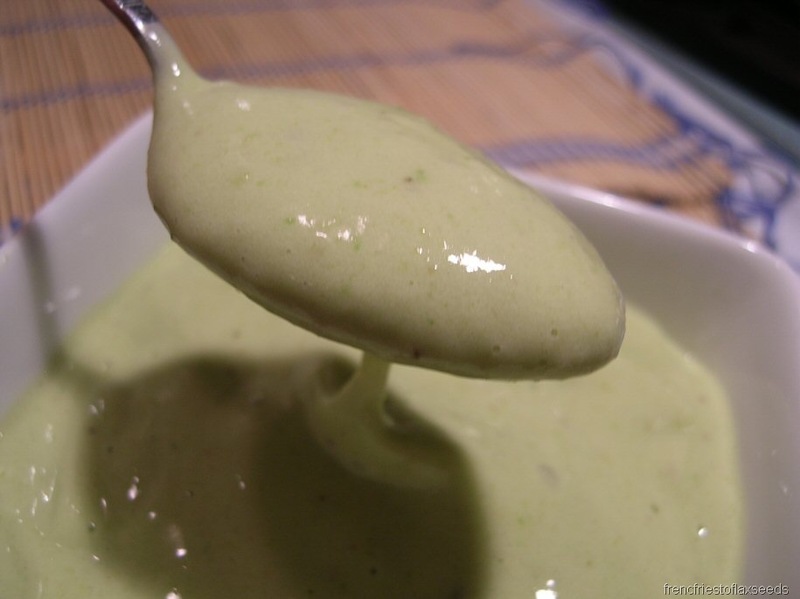 Tonight’s snack was inspired by Lori at Fake Food Free and her Banana & Avocado Vitamin. Whiz it all up with your choice of whizzer (I used the immersion blender), and you get this light, creamy, delicious creation. This is a definite keeper. You could taste the avocado ever so slightly, in a good way. I just love the texture the whole thing took on. I may need to stock up on bananas and avocados. 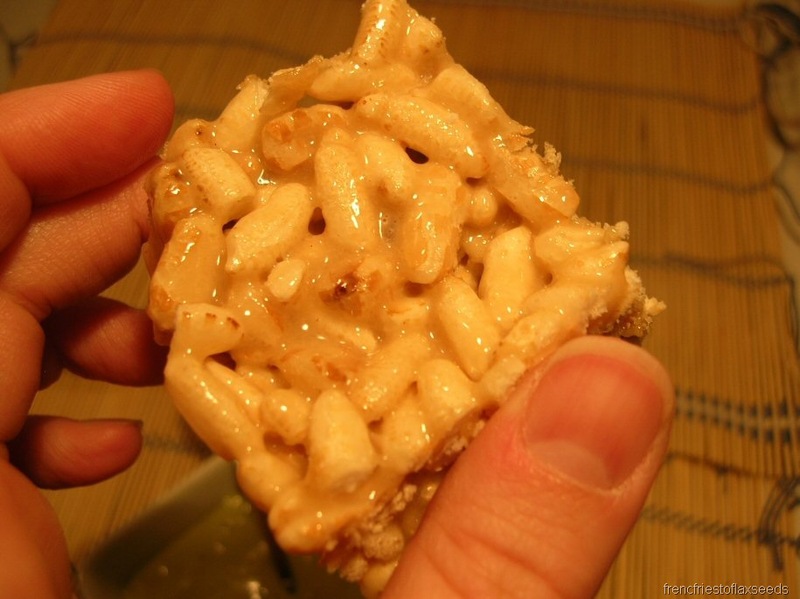 I also grabbed one of those addictive “Nicer” Krispy Squares, because well, they are that good. Not really sure why this photo turned out yellow, but whatcha gonna do? So, I’m sure you are all wondering what the title of this post is referring to, seeing as nothing I ate was really that salty. Well, there was a piece on the news about the salt content in various foods in Canada. A British group did a study looking at the salt content in popular foods/brands, like Subway, McDonalds, Kellogg, etc across different countries, and it turns out that those products sold in Canada have some of the highest salt contents of all the countries & foods looked at. I must say, I was a little shocked by this. I appreciate that you would alter your formula to suite the palates of the customers in various countries, but I didn’t realize that us Canucks like our foods extra salty. I’m really surprised, and not impressed, with both the food companies in question, or our government for not acting on this health issue. I would have thought that the salt content in foods would be equivalent between Canada and the US, but that’s not even the case. You can read more on the study here: Saltier Foods Sold In Canada. I always buy food and freeze it if its in the reduced section! Nothing wrong with that! I stopped adding salt to my food ages ago. Probably 1-2 years ago?? I’ve never turned back! YUMMY dinner! 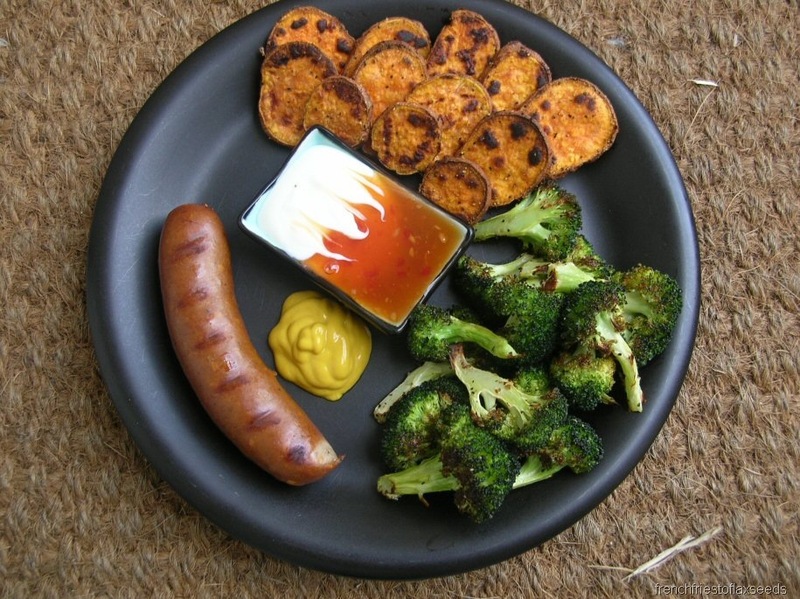 those sausages remind me of ones my Dad used to grill with the cheese in them. Wow, I never knew abother country that had saltier foods than us, crazy. Well, if you don’t eat out a whole lot it shouldn’t be a problem, right? I love your banana, avocado, milk creation. That’s a random combination, but I really like it! 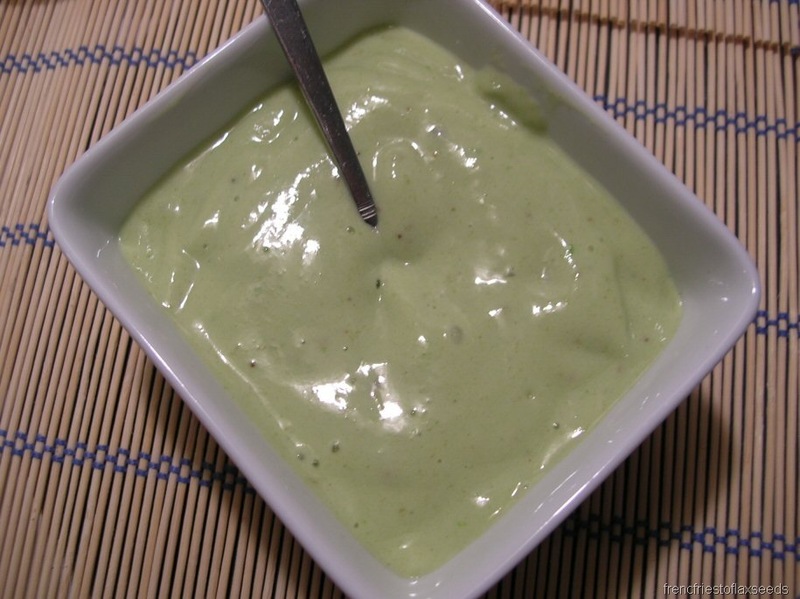 Avocado and banana are both soft and delicious, I’ll have to try that one out! I also dig the roasted broccoli. 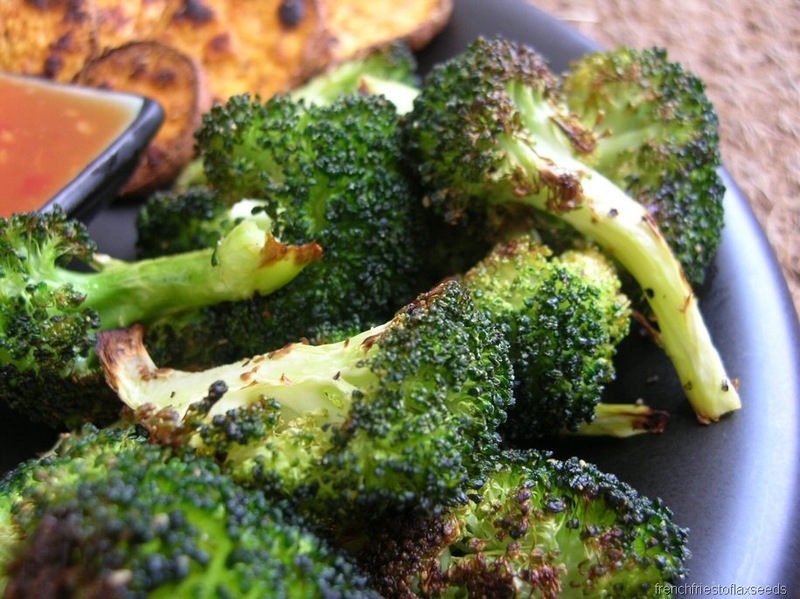 I usually steam my broccoli (like you said) but roasting sounds like a nice little change, great idea. 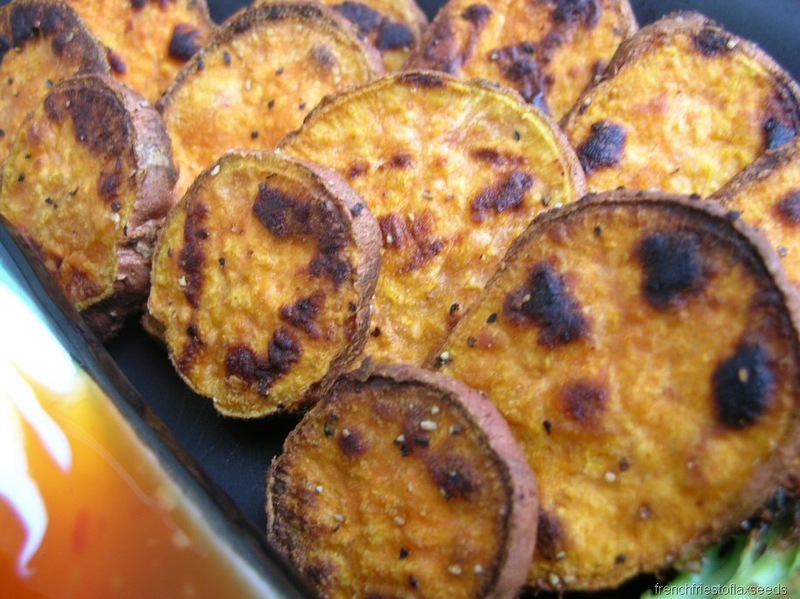 Love those sweet potatoes!! Did you dip them in the sweet chili sauce? That sound delicious – I may have to do that myself!! Oh I love sausage. Like, love it! It’s one of my favorites, how weird right? Esp cuz I don’t really dig meat too much. Yours looks SO dang good. that dinner looks incredible!! so so beautiful!! i want to try a smokie!! Dinner looks SO good. I LOVE the arty sauces, so pretty. And that banana/avocado mix sounds deeeelicious. I just heard the Salty Canada thing too. Weird. And kinda crappy! First off, I love all the food in this post. I haven’t had a smokie in ages and now have a hankering for one! I also really like the looks/sound of the banana/avocado mixture. YUM! I have to say I’m slightly peeved about the article as well! I love All Bran and wasn’t happy to read how much salt is in there! That a crock of you-know-what! !